Often as Moms we forget to take care of ourselves. We get so caught up in taking care of our children, and their health that we sacrifice our own well-being. One really simple way to take care of ourselves is very quick and relatively inexpensive: taking vitamins! Rainbow Light just sent me a 30 count of their Women's One vitamin. This months supply of vitamins is an excellent way for me to keep the fall colds and other illnesses away! 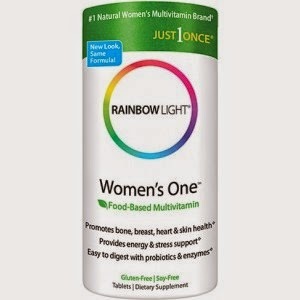 "Rainbow Light Women's One Multivitamin/Mineral is the #1 selling food-based multivitamin customized for women's health. Women's One is complete energizing nutritional support to balance and protect the female system. Women One's research-based multivitamin protection goes beyond minimal 100% Daily Values to deliver customized, protective nutrient potencies in a nourishing food base for women's optimal health. Women's One contains an energizing, potent B-complex featuring 800 mcg folic acid, plus magnesium, boron and calcium for cardiovascular support and skeletal health. Women's One is made with 25 million bioactive probiotics in addition to broad-spectrum enzymes and 800 IU Vitamin D to provide the most complete daily digestive and immune support." All in all this is a great vitamin and offers everything a woman needs! It is a little big and does not smell particularly well, but I think that is true of most vitamins! At only $35.99 for a 3/month supply it is definitely affordable on any budget. Remember, as important as it is to take care of your children, it is also important to take care of YOU! Disclosure: The above item was received in order to facilitate review. I have not been compensated for this post. This information is not intended to take the place of a doctors advice so make sure to speak with you doctor before any changes in medication. Top Notch Material blog will always provide honest opinions, beliefs or experiences on products reviewed. We will only recommend products or services that we feel are of benefit to our readers. If you have any questions, please contact me at nursemommypaige at yahoo dot com. The disclosure is done in accordance with the Federal Trade Commission 10 CFR, Part 255 Guides Concerning the use of Endorsements and Testimonials in Advertising.